I'm not normally impressed by celebrity or author endorsements of books, but when it's Joanna Lumley and she says "As mad and believable as a dream. Dreadfully funny and oddly unsettling. I think Graham Rawle may be a genius." I will listen. Patsy cannot be wrong. 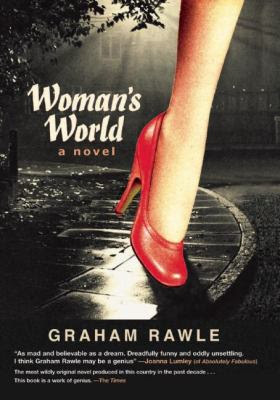 Woman's World by Graham Rawle is one of the more original books, both in story and visually, that I have read in a long time. Rawle created the book out of 40,000 text fragments cut from 1960s women's magazines. Painstakingly, over five years, he wrote the rough draft and then arranged the text fragments to tell the story. It is an amazing work of collage art. One reviewer complained that Rawle's collage technique was tiresome after a few pages. I have to totally disagree. I read this 400+ page book in the better part of a morning. Not only did the story keep me turning pages, but my eyes were continuously engaged on the page. Each page offers something new to look at. The text fragments gave the story a sometimes odd flavour, for example, "Red rage rose within me like mercury in a toffee thermometer and I know I had to leave before I reached the boiling point for fudge." I wouldn't want to subsist on a diet of books like this one, but it certainly was a welcome treat. 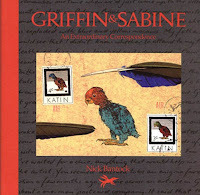 It brought to mind Griffin and Sabine: An Extraordinary Correspondence by Nick Bantock. Each page is beautifully illustrated and contains an envelope with a letter from the lovers. It has a unique visual appeal and gives the reader a strange sense of intruding on a private romance. 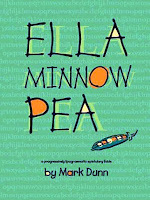 While in a different category visually, I was also reminded of Ella Minnow Pea by Mark Dunn. The island of Nollop (named after the person who penned - The quick brown fox jumped over the lazy dog) is a totalitarian regime. As the letters from Nollop's statue drop off, they are banned from use on the island. The novel is a series of letters written with progressively fewer choices in letters of the alphabet. Although this books was straightforward typeface, I found it to be a more difficult read than Woman's World.